I spent the other day (Sun 2nd Feb) pruning with Gabriel, my first ever "intern" who spontaneously volunteered to work for free in return for whatever I could teach him! Wow! I was honoured that anyone would want to do that. Lots of people have helped me in the vineyards for free over the years of course, but they were always people I already knew - family, friends, regular consumers of my wine, etc. On this occasion it was different, as I'd only met Gabriel (Sánchez Blocona) about 2 weeks ago at a tasting that we were at. As it happened, it was a tasting of the wines of Basilio Izquierdo, which would merit a whole post to itself, as there were some really incredible wines there. Including some really old ones (for me!) like a CVNE 1948 which is the oldest everest wine I've ever tasted in my life. But I won't go on about that - I've been getting paranoid lately about turning into a wine-bore! I think that's what happens when you read the Hosemaster of Wine! Anyway, that was in the morning. After lunch (here) (which, btw, was the most expensive lunch I've ever paid for in my life, and where I witnessed for the first time a bottle of wine being opened with a pair of heated tongs!) we (Gabriel and I) decided to gate-crash another tasting in the evening. This one was one of these wine-tasting clubs of friends who get together regularly to taste and comment on interesting wines. I knew a few of these friends (including Alfredo Maestro) so I figured that they wouldn't mind. As luck would have it they were doing a blind tasting, which I love, even though I never identify any of the wines. The only clue we had was that all 6 bottles were non-Spanish. Incredibly, I was the only one who identified the country of provenance of 4 of them (Georgia)! I think this was because no-one else there had tasted Georgian wines before, while I had - once, two years ago in London at RAW fair. Amazing! Then of course I had to explain that I'm not an expert or even experienced taster and that it was just luck that I remembered those wines. This is true, I'm a very inexperienced wine-taster, as the only tasting I ever do is of my own wines, and even then just checking for faults/off-tastes/strangeness/etc. I'm practicing though, and I try to get to whatever tastings I get invited to, time and tasks permitting! Gabriel on the other hand is a wine-geek, an experienced taster, and collector of old rare wines. But he doesn't know much about grape-growing, vineyard work, pruning, etc. So, there was a win-win situation if ever there was one. 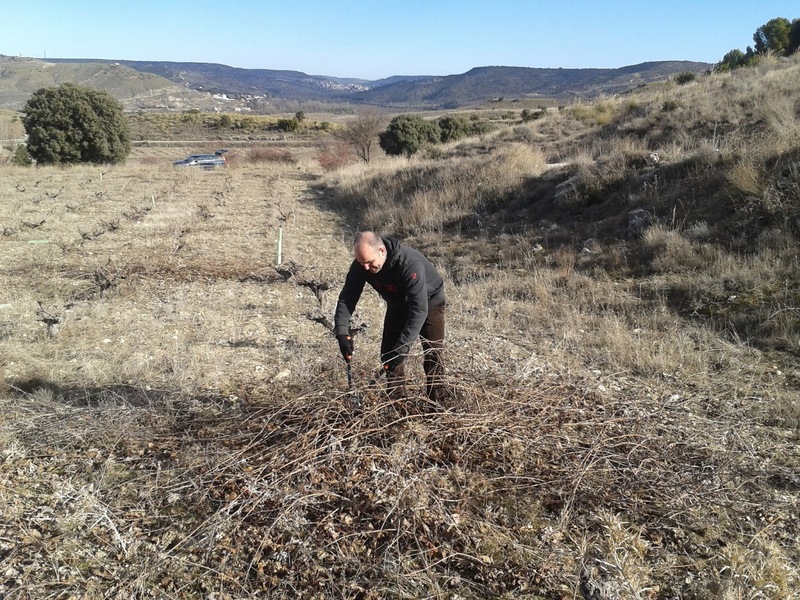 Now pruning is quite a skilled task, it's not just manual labour; so it's a bit of risk to just let anyone loose in your vineyard with a pair of pruning sheers! :) A bit of a risk only in the sense that he/she might snip off a bit too much, or the wrong canes, and hence reduce the production of a few 'mutilated' vines! I mean to say, it's not a catastrophy or a disaster. 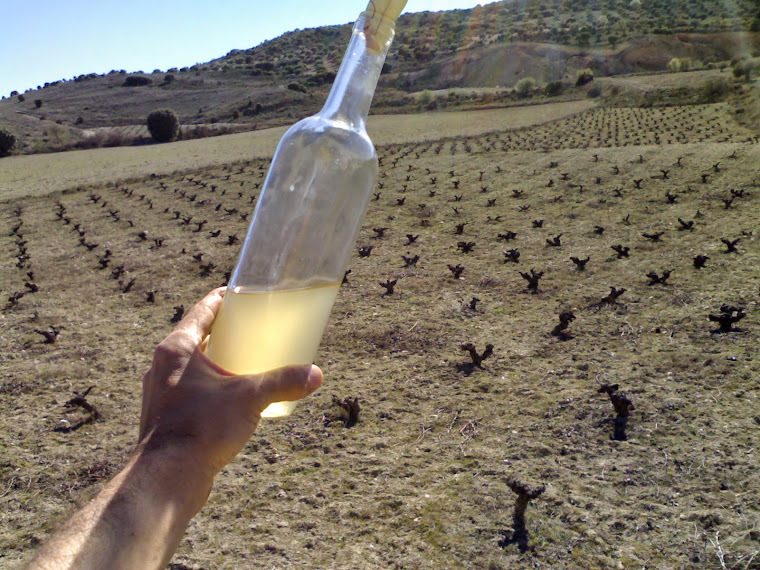 Vines can survive a lot worse than a crazy pruner :) But in any case, why do it wrong, when it's so easy to do it right? So this is what we did: First he just followed me and watched, while I pruned and explained. But that gets boring after a while and the 'student' doesn't really learn anything new, after so much theory. So I sent him a vine ahead of me to do some pre-pruning. This entails snipping off all the obviously unwanted little canes, the canes growing from obviously wrong places and those growing in obviously wrong directions (all of which I explained beforehand). I also got him to snip back all the remaining major canes but leaving 5 or 6 buttons. Then I myself would either prune these canes right back to the wood, or prune it to 1 or 2 buttons, as appropriate. Those tasks that I set Gabriel to are very useful for getting to know those obviously useless canes, which can then just be snipped off without a second thought, and also for learning to handle the pruning shears, getting to know their weight and balance, how far they open, possible angles of entry, etc. The next time he comes out to help me, I'll teach him how to actually choose which canes to prune and keep, and which ones to prune right back to the wood. That is of course the most important piece of knowledge in pruning. How well you do that impacts not only the quantity of grapes that the vine will give you that year, but also long-term it will affect the health, vigour and longevity of that vine. Gabriel is also an awesome photographer, and he took all the photos in this post (except for the one of himself, obviously!). I'd be happy to teach anyone who wants to learn what I know. It's just a question of arranging to meet. Which is actually more difficult than it sounds because I usually don't know when I'm going to prune until a few days before! Anyway, feel free to contact me if you're interested. Very pretty, but is it art? ha ha!